By the 18th Century the Penal Laws, which barred Catholics from most areas of public life and from owning property, had resulted in widespread poverty and a reliance upon the (low-maintenance) potato as the primary food crop for the rural population. These extreme conditions fostered a spirit of rebellion and in 1798 there was an Uprising led by Wolfe Tone. During that year some 1,100 French soldiers landed in north Mayo to fight in support of the insurgents. They captured a number of Mayo towns and villages, including Newport and Castlebar. A priest with Achill connections, Fr. Manus Sweeney, was seen speaking with a French officer (Sweeney had been educated in Paris) and after the rebellion was crushed he was imprisoned as a collaborator. He escaped custody and fled to Achill but after a manhunt he was captured and eventually hanged on the main street in Newport. A memorial to Fr. Sweeney stands at the Dookinella end of Trawmore Strand on Achill. 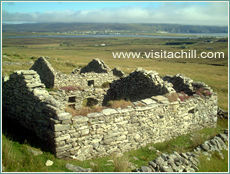 In 1831 a Protestant Mission arrived in Achill. This innovative project was to have major implications for the development of Achill. Led by a young English minister, the Rev. Edward Nangle, the Achill Mission was the first to be established among the native Irish using the Irish language. The Mission, also called The Colony, was based in Dugort and its aim was to convert the local population to the Protestant faith. Over the next 50 years the Colony established schools, a small hospital, an orphanage, cottages and a hotel (now The Slievemore). They cultivated fields using the latest agricultural methods. During the years of the Great Famine (1847-51) they offered soup to the starving locals - in return for renouncing their Catholic faith. The threat posed by the Colony prompted the (Catholic) Archbishop of Tuam, Dr. John McHale, to establish a rival institution on Achill. He set aside land in Bunnacurry for the building of a monastery and established schools for local children. The Colony finally closed in the 1880s having profoundly affected the evolution of Achill and introduced the first phase of tourism to the island. In the last decade of the 19th Century an incident occurred on Achill that brought notoriety to the island. A local man, James Lynchehaun, was involved in a violent assault on a landowner and his subsequent case made legal history. Lynchehaun was employed by an English landlady, Agnes McDonnell, on her estate at the Valley House in The Valley. He fell out with his employer, and one night in 1894 she was found savagely beaten and with her home set on fire. Lynchehaun was arrested but escaped custody twice. On the first occasion he is said to have hidden out on Achill while a furious man-hunt was launched by the British authorities. He was captured after allegedly being betrayed for a bottle of whisky, but again escaped custody and fled to the United States. It was there that he made legal history after he successfully argued that he should not be extradited to face trial for what he claimed was a political crime. Agnes McDonnell survived the attack but was disfigured for life. The Valley House is now a hostel and bar. The first bridge to connect Achill Island to the County Mayo mainland was built in 1887 at Achill Sound. It was named after the founder of the Irish Land League, Michael Davitt. Seven years later, in 1894, the Westport-Newport railway line was extended to Achill Sound. Both these developments made Achill more accessible, though this progress was tinged with tragedy. The first journey on the railway line to Achill carried the bodies of local victims of the Clew Bay Drowning. A boat carrying young people from Achill to a steamer in Westport had overturned in Clew Bay, drowning 32 people. They had been en-route to Scotland to work as potato pickers for the summer. Picking potatoes, or 'tatie hoking', in Scotland was a matter of course for young Achill people in the late 19th and early 20th century. In 1937 another tragedy afflicted Achill when ten young people died in a fire in a 'bothy' (barn) in Kirkintilloch, Scotland. They had been potato picking. Their bodies were carried from Westport to Achill Sound on the railway line, the last journey to be made on this branch of the railway.